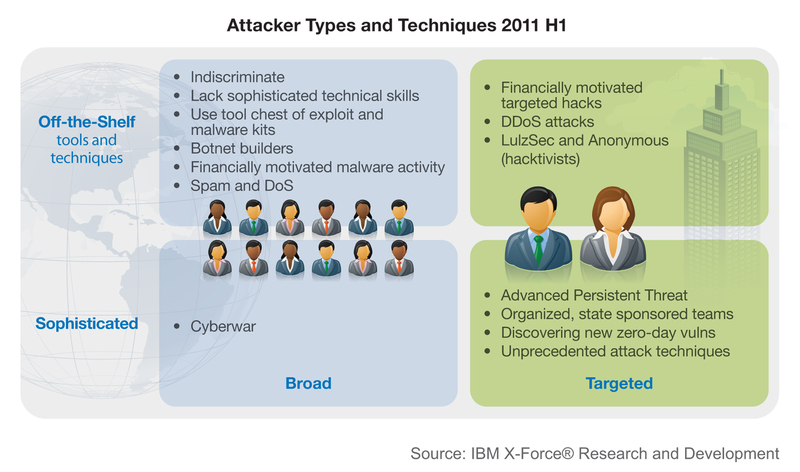 Attacker types and techniques in 1H2011 identified by the IBM X-Force Mid-Year Trend & Risk Report. The study revealed mobile security exploits would likely double in 2011. Okay, it’s my last day in Bangalore. At least for this particular journey. I don’t have any more India-related news, except to report that the Kolkata Night Riders beat the Royal Challengers Bangalore in the CLT20 last night, here in Bangalore. KKR won by nine wickets, and now I know why there were such sad faces in the stadium as I watched the end of the match late last night on TV. As I was watching cricket, IBM was releasing the results of its “X-Force 2011 Mid-Year Trend and Risk Report,” a tiding I always attempt to cover in some depth, both because I find the reports fascinating and enlightening, and because I consider it a real service that IBM is providing to the global IT community. Poised at the frontline of security, the IBM X-Force team serves as the eyes and ears for thousands of IBM clients – studying security attack techniques and creating defenses before many vulnerabilities are even announced. The X-Force Mid-Year Trend and Risk Report is based on intelligence gathered through IBM’s research of public vulnerability disclosures as well as the monitoring and analysis of an average of 12 billion security events daily since the beginning of 2011. Drumroll, Please: Moble Exploits Are Ripe For Exploitation! Adoption of mobile devices such as smartphones and tablets in the enterprise, including the “Bring Your Own Device” approach, which allows personal devices to access the corporate network, is raising new security concerns. IBM X-Force has documented a steady rise in the disclosure of security vulnerabilities affecting these devices. X-Force research recommends that IT teams consistently employ anti-malware and patch management software for phones in enterprise environments. Click to enlarge. 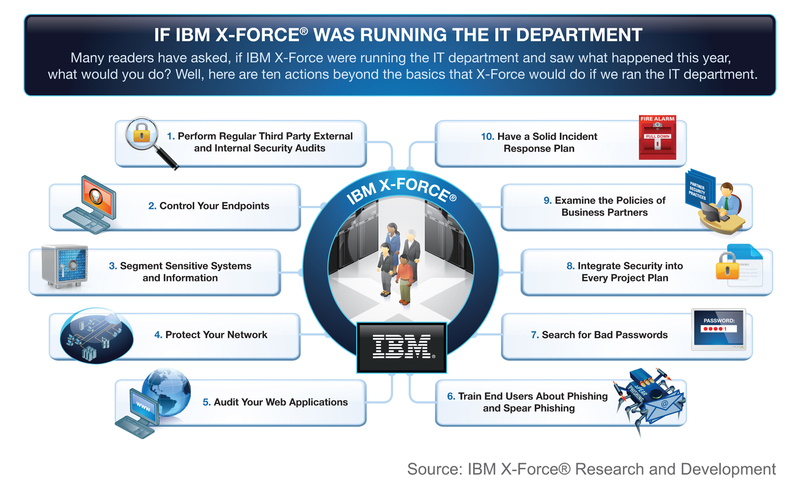 This graphic explores what the security situation might look like if it were run by the IBM X-Force team as they attempted to deal with this year's exploits. Malicious software targeting mobile phones is often distributed through third-party app markets. Mobile phones are an increasingly attractive platform for malware developers as the sheer size of the user base is growing rapidly, and there is an easy way to monetize mobile phone infections. Malware distributors can set up premium texting (SMS messaging) services that charge users that text to a specific number. Malware then sends text messages to those premium numbers from infected phones. Some mobile malware is designed to collect end user’s personal information. This data could then be used in phishing attacks or for identity theft. Mobile malware is often capable of spying on victim’s personal communications as well as monitoring and tracking their physical movements via the GPS capabilities common in these phones. The X-Force team also reports that the percentage of critical vulnerabilities has tripled thus far in 2011. X-Force is declaring 2011 the “Year of the Security Breach” due to the large number of high-profile attacks and network compromises that have occurred this year. 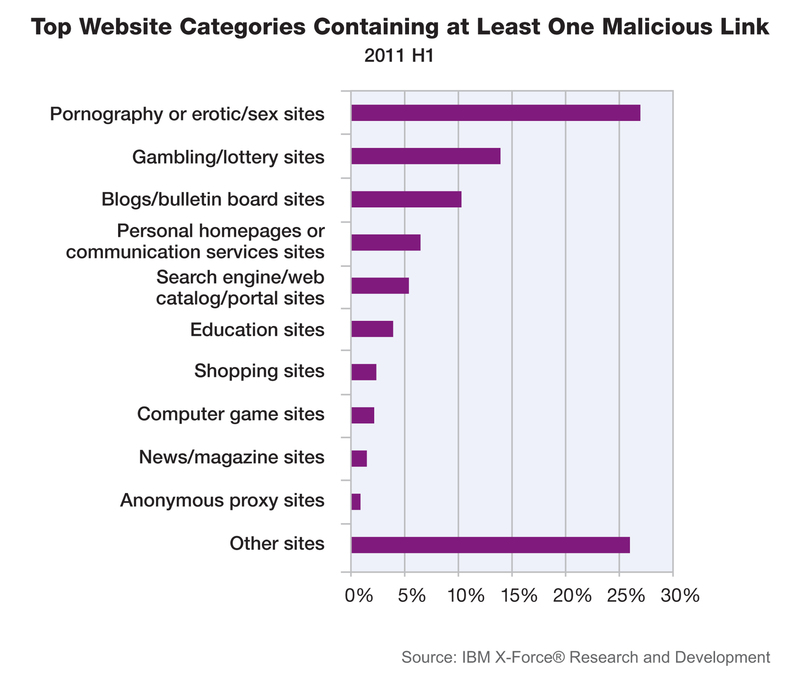 This graphic explores the top website categories from the 1H2011 report containing at least one malicious link. Teams of professional attackers motivated by a desire to collect strategic intelligence have been able to gain and maintain access to critical computer networks through a combination of stealth, sophisticated technical capabilities and careful planning. These attackers are often referred to as “Advanced Persistent Threats” (APTs). The success of APTs has raised the profile of “whaling,” a type of spear phishing which targets “big fish,” or those positioned in high levels of an organization with access to critical data. These targeted attacks are often launched after careful study of a person’s online profiles has armed an attacker with the information needed to create a compelling phishing email that the victim will be fooled into clicking on. Attacks from ‘hacktivist’ groups, who targeted web sites and computer networks for political ends rather than just financial gain. Hacktivist groups have been successful in using well known, off-the-shelf attack techniques such as SQL Injection, which is one of the most common attack techniques seen in the Internet. Anonymous proxies have more than quadrupled in number compared to three years earlier. Anonymous proxies are a critical type of website to track, because they allow people to hide potentially malicious intent. Although the X-Force team declared 2011 as a watershed in high-profile security breaches, the report also uncovered some improvements in areas of computer security that show headway in the fight against crime on the Internet. The first half of 2011 saw an unexpected decrease in web application vulnerabilities, from 49 percent of all vulnerability disclosures down to 37 percent. This is the first time in five years X-Force has seen a decrease. As major botnet operators are taken down and off-line by law enforcement officials, the report shows a trend in the decline of spam and more traditional phishing tactics. After years of consistent spam growth until the middle of 2010, there has been a significant decline in spam volumes in the first half of this year.In the first half of 2011, the percentage of spam that is phishing on a weekly basis was less than 0.01 percent. Traditional phishing has greatly declined from the levels X-Force was seeing prior to the middle of 2010. Also of note, the SQL Slammer Worm has been one of the most common sources of malicious packets on the Internet since its appearance and naming by the IBM X-Force team in 2003, but it has fallen down the list after a dramatic disappearance observed in March 2011. The most recent analysis strongly suggested that the SQL Slammer Worm’s disappearance is due to an unknown source or actor. The analysis showed that a time-based trigger using a Slammer’s server clock was used to shut it down, proving that it was disabled by a single cause. The X-Force report uncovered numerous attacks that target traditional security vulnerabilities. According to the report, attacks on weak passwords are commonplace on the Internet, as are attacks that leverage SQL Injection vulnerabilities in web applications to compromise backend databases. Databases have become an important target for attackers. Critical data used to run organizations — including financial/ERP, customer, employee, and intellectual property information such as new product designs — is stored in relational databases. 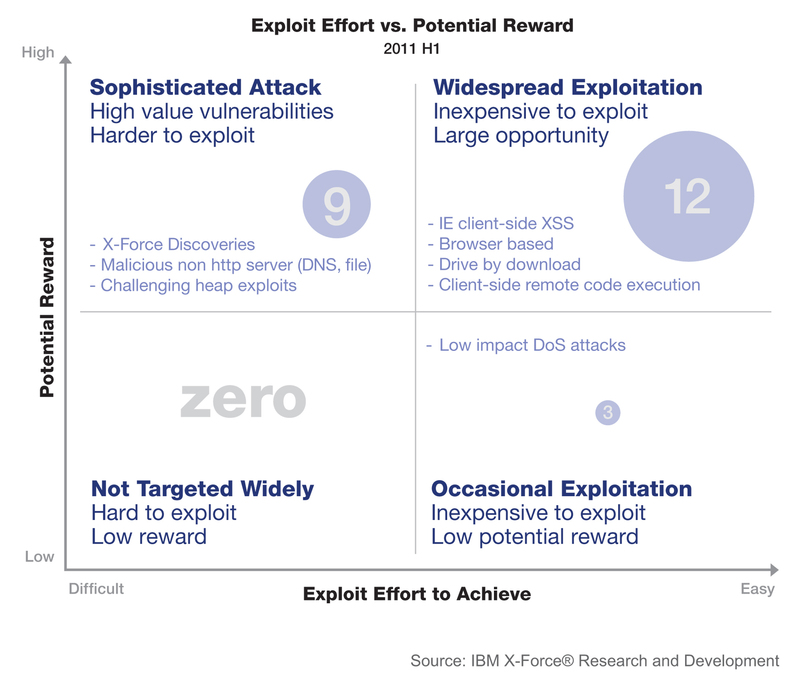 This graphic reveals insight into the exploit effort versus potential reward in the 1H 2011 X-Force report. To help combat security risks and to foster collaboration amongst security industry leaders, IBM is launching the IBM Institute for Advanced Security in Asia Pacific in order to combat growing security threats in the region. The IBM Mid-Year X-Force report states that top countries originating spam have shifted to Asia Pacific, with India sending out roughly 10 percent of all spam registered today, and South Korea and Indonesia also making the top five list. This Institute joins its predecessors in Brussels, Belgium and Washington, D.C., focused on European and U.S. clients respectively. This report comes from IBM’s X-Force team, the premier security research organization within IBM that has catalogued, analyzed and researched more than 50,000 vulnerability disclosures since 1997. It is the result of the work done in IBM’s nine global Security Operations Centers, which is provided as a managed security service to clients. The report gathers facts from numerous intelligence sources, including its database of computer security vulnerabilities, global web crawler, international spam collectors, and the real-time monitoring of an average of 12 billion security events every day for nearly 4,000 clients in more than 130 countries. You can learn more about and download the report here.